There are few things more entertaining to me then seeing someone freak out in a haunted house (or on a roller-coaster). So the thought of doing an escape room in a haunted house has continually piqued my interest. I’ve done it in one other place, multiple times, but when I was out in Colorado on vacation and saw this room, I had to reach out. The room is a sprawling layout across multiple floors and includes live actors, should you choose to have them. You have the option of choosing the difficulty as well as how scary you would like your experience to be. We chose medium difficulty and medium scary, fyi. The lord of the manor, Dr Stuart von Heltin (no idea if I spelled that right), is essentially a mad scientist. You manage to find your way into his home and end up having to make your way through the building, finding your way out of the elevator you’re locked in, through the “screamatorium” (his lab where all of his crazy experiments take place), into the “catacombs” (where the rejects from said experiments roam free), and back into the lobby so you can get out of the building. All the while, we had at least 1 actor with us at all times. And he was great. At one point, Steph said “… Marco …” and he looked at her and said, “MARCO?? ?”, and took off after him! No clue where Marco was or where he went to look for him, but it was one of the funniest things I’ve ever seen. The mission for this room was pretty simple. Escape the elevator, make your way through the “screamatorium” and “catacombs”, and GTFO, otherwise be trapped and subjected to the evil/crazy doctors “experiments”. I know for a fact I didn’t see everything we worked on (maybe 85 or 90%, but still) especially in the basement/catacombs, but The Elevator had a plethora of puzzles waiting for us. There were standard alpha-locks in the elevator, there was an actual game that led to something in the kitchen, logical deduction, colors, electronics, keys, stuff with skulls…I could probably go one for another 2 lines but I’ll stop before I give anything away. One thing to note is that you will constantly be working on something in The Elevator. There were 5 of us and we were never not busy. Additionally, I enjoy having to traverse the entire area multiple times, and I was definitely doing that, especially in the basement (catacombs). The floors get progressively larger (not to mention more difficult), and as time goes on the actors become more of a hindrance than a help (but still hilarious). No lock type was repeated, that I can recall (other than the hasps in the elevator), which is a feat in itself. 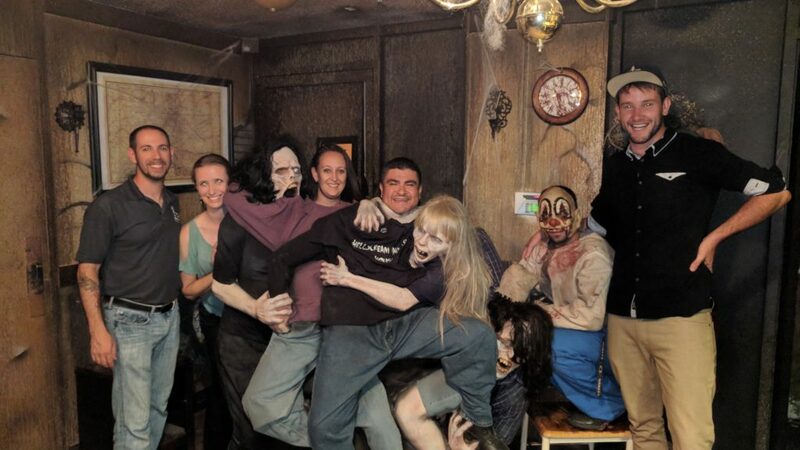 Regardless, once you get out into the first floor you can really see where these guys excel over many other escape rooms. (In case you were wondering or you didn’t gather from the rest of the post, aesthetics and visuals.) They really made every room look the part (kitchen, lab, catacombs). Remember, this is a haunted house too, so I can only imagine what that looks like (hoping to check that out in 2019). As you progress through the levels of the building, however, the puzzles get more difficult and more spread out, meaning you have to cover more ground finding objects to use to solve the puzzles. The range was from reading comprehension (a 1), to mini-games, to low-tech, to high-tech (a 9). There was something for everyone and, again, we were never not busy. I’m not sure if I would have preferred making my way into the elevator and getting locked in or starting in the elevator and making our way out as we did in this escape. Regardless, the elevator aspect of it is totally unique. I have often wondered if there were any rooms that made use of multiple floors, and this is a real first. Once you got out of the elevator and onto the first of the floors, everything you did led you back to the elevator, as the floor buttons were all covered with a lock and hasp that you need to open to access the button for another floor. Every floor essentially filtered you to a final combination which, when you couldn’t find where to put it you would say “Oh yeah, the elevator!”. Unlock it, go to the next floor, repeat. It was a really simple mechanic that worked perfectly. The live actors definitely helped make the room more enjoyable, appropriately in costume for the locale they were in, and the commentary they provided throughout, whether it be just snarling over your shoulder or cracking an opportune/inappropriate joke, was clutch. A lot of the entertainment for me in this room was Marco and Holly freaking out (sorry…). Aside from that, the live actors were on point, the puzzles fun to solve, and the running around solving things put to good use (I mean that literally, we were running around all the time, back and forth around the floors). We had Vince on a walkie in our ear, as well as the “clues” the actors were giving us. I say “clues” because they were more harmful than helpful at times. Vince was helpful, asking if we wanted help or providing a nudge if we were on the right track but struggling. No help given was overly blatant in what he told us, which is the way we like it. There is nothing bad I can say about this experience. I loved every minute of it, and as we have said time and again, the experience makes the room (the immersion factor) just as much as who you play with. They (the team) made it so much more fun while relying on me for guidance. Final Thought: I am so glad I found this place and that they were accommodating to us. This is easily one of the most fun-to-play rooms I’ve escaped and I immediately wanted to do another (we played The Pen two days later). These guys fill a very unique niche and they do it extremely well. I can only imagine what the haunted house looks like. Still have another room to do, though, The Manor. Guess I’ll have to go back after all, and I suggest you do the same! One last thing: Don’t forget about the discount code they provided: “Escape2018” gets you 50% off bookings on Thursdays and Sundays.